The star of all animals, the cat, is shown on deco canvases ! 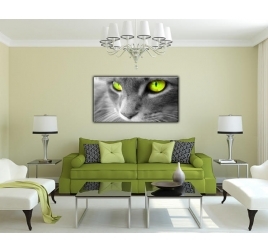 One of man’s best friends, famous for its purring, its soft fur, is shown on a cat canvas for your interior. 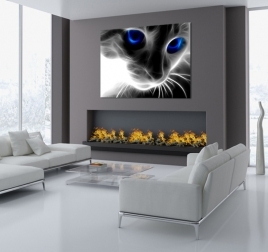 With cats heads as portraits and piercing eyes, those deco cat canvases will be the perfect design canvas for all the lovers of this ball of fur. 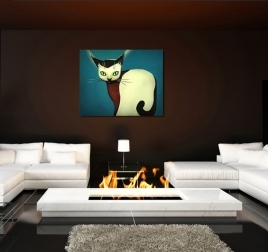 Do not miss those contemporary cat canvases that will undoubtedly soften your decoration while keeping it modern. A modern art print abstractly representing a cute kitty with its beautiful green eyes and its splendid white coat. This decorative canvas is 60 x 50 cm (23.62 x 19.69 po). 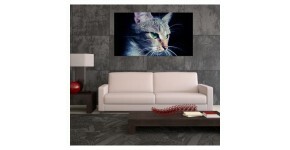 Free delivery within 48/72 hours in metropolitan France for this cat art print. Each decorative art print is treated to withstand UV and moisture. This abstract art print imaginatively illustrates a futuristic cat with a lively and deep look. This modern canvas is 75 x 50 cm (29.53 x 19.69 po). Free delivery within 48/72 hours in metropolitan France for this animal art print. Each modern art print is treated to withstand UV and moisture. A portrait of a green-eyed cat for a premium wall decoration. This decorative art print is 100 x 60 cm (39.37 x 23.62 po). Free delivery within 48/72 hours in metropolitan France for this contemporary art print. Each animal art print is treated to withstand UV and moisture.